LAWRENCE — For Perpetua “Betty” Dreiling, winning was one step below a long shot: The way she saw it, she had no shot. After all, not since the fifth grade had she won something in any sort of chance drawing. Even then, it was only a pasta strainer in a church bazaar bingo. “When I saw [the car raffle] in The Leaven, and I knew Father Mick [Mulvany, the pastor] from way back, I thought, ‘This is a good place, this helps the children, this helps with my charity contributions,’” she said. So Betty purchased a raffle ticket — or five raffle tickets to be exact, for $50, from Corpus Christi School in Lawrence, for a chance to win outright a Chevy Cruze LS or various multi-year leasing options. She was entered to win the new car. The car is part of a donation Greg Maurer, of Dale Willey Automotive, and his wife Kristin — parishioners and parents of son Garrett, who attended Corpus Christi — made not only in 2018, but for the upcoming 2019 and 2020 school years as well. And the story of stewardship continues. On the night of April 14, a name came out of the hopper: It was Betty Dreiling’s. Her plan for the car all along — from the day her daughter Anita Dougherty bought tickets on her behalf to the day she received news that she’d won — did not waver. The car was to go to her great-grandson Jack Dougherty, who goes to a Catholic school, Benilde-St. Margaret near Minneapolis. From the perspective of Corpus Christi School, it is a blessing to see that stewardship and support of Catholic education pay off to the benefit of a young adult who only recently passed his driver’s education classes and will soon start driving. “I’m continually amazed at the goodness of people. 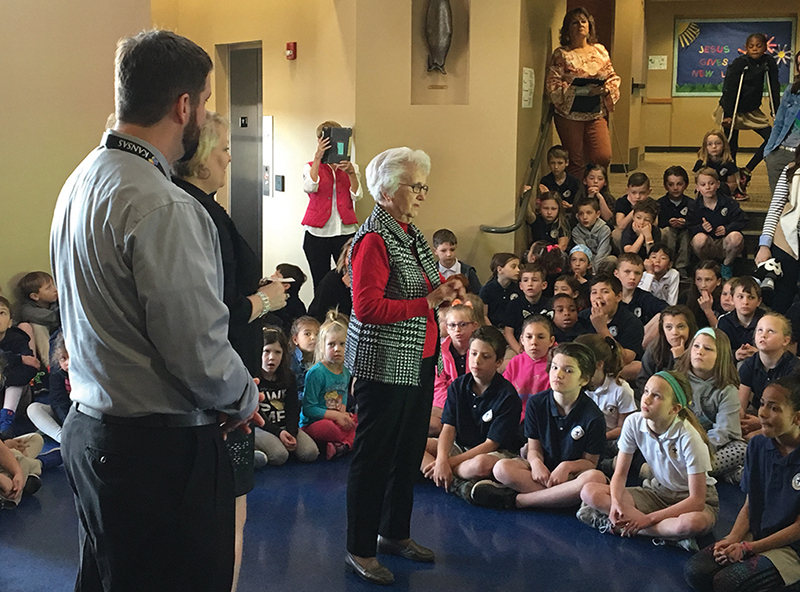 They believe in the vocation, they believe in the mission of Corpus Christi, a parish school,” said principal Mary Mattern, now in her 16th year at Corpus Christi. For a chance to enter Corpus Christi’s 2019 car raffle, buy a chance to win a brand-new car by sending an email to: calebr@cccparish.org. All proceeds benefit the parish school.